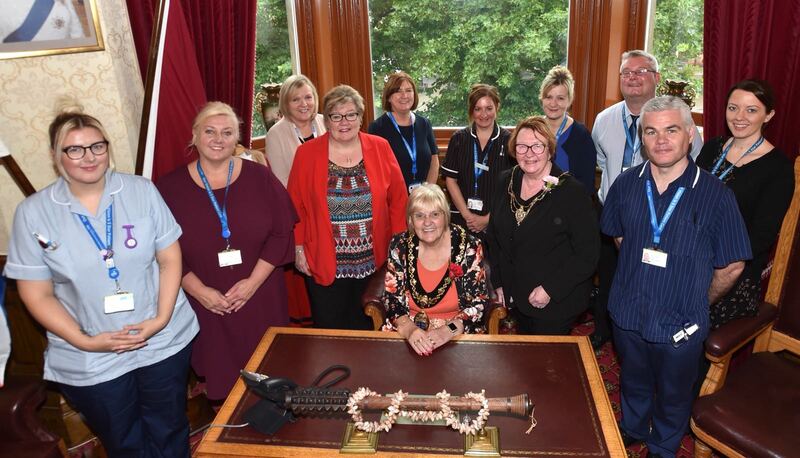 The Mayor and Mayoress of St Helens had the honour of hosting frontline staff from St Helens and Knowsley Teaching Hospitals NHS Trust today (Thursday 6 September) in what was a double celebration. Last month, the Trust was named the best acute trust in England for the second year running after inspections were carried out at Whiston and St Helens hospitals, and for the first time at the Trust’s new Intermediate Care Unit at Newton Hospital. The Trust was the only acute trust in the entire country to score 100 per cent for facilities for patients living with a disability and for the condition of the hospitals buildings. In recognition of this fantastic achievement – and as a way of celebrating the 70th anniversary year of the NHS – the Mayor of St Helens, Councillor Pat Ireland, arranged for Trust staff to visit her and the Mayoress, Lynn Glover, in the Mayor’s Parlour to hear about their success, and to learn more about the work they do, over a cup of tea. Councillor Ireland, who for her mayoral year is raising money for the Diabetes Centre in St Helens Hospital, said: “One of the best things about being Mayor of this great borough is getting the opportunity to meet the people that make a real difference in our communities, and it was a privilege to be in the presence of so many inspirational people today that do it on a day-today basis. Among those in attendance was the Chief Executive of St Helens and Knowsley Teaching Hospitals NHS Trust, Ann Marr, who said: “I would like to thank Councillor Ireland for recognising the contribution of our staff to the local community and inviting us to celebrate 70 years of the NHS here at the Town Hall today.